If you could choose to keep only one part of you, what would it be? If you could be an animal for a day, which animal would you be? If your boyfriend/girlfriend cheated on you, how would your react? Stay with them, and allow them to cheat on you. You would be very hurt, but would stay with them. Which trait do your consider yourself to be most like? To become a more powerful leader, how far would your go? None, be kind to everyone. A smart thinker, but not always. Multiple people you have 'things' with. You are the Greek God Zeus! You enjoy being a leader, but you are not always a smart thinker. You are looked at as handsome and muscular. Sometimes you do bad things to make yourself look better. You are a powerful person, but may be cocky or rude to your followers. You resemble Hera! You are very passionate about your family. You get jealous easily, and may release anger on those who spend time with your friends. You are looked at as very beautiful, and you are respected, but also feared. You are the Greek Goddess Echo! You are very social, and love to chat, but that sometimes gets you in trouble. You meet new poeple all the time and fall in love with many. Love can really hurt you, and your innocent past has taught you that. You resemble the Greek God Cronus! You are very strong, and uncontrollable in some ways. You have lots of power, and you will do anything to stay that high up in the throne. You always fear you will become less powerful, and sometimes ignore the things in plain sight. You can be a really greedy person, and you envy what others have. Take this short quiz to see which God or Goddess matches your personality best! 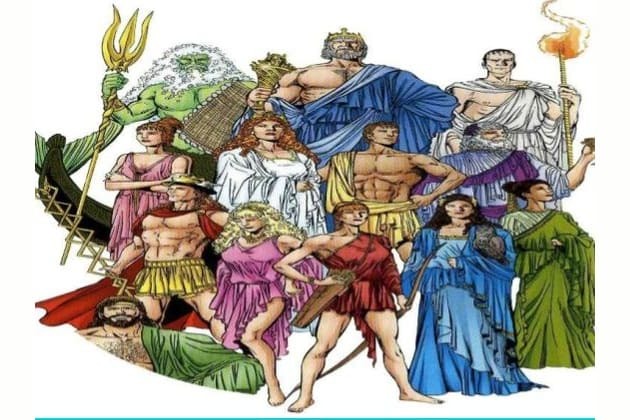 come find out if you are Hera, Zeus, Echo, or Cronus!